The star-studded evening will feature Laurie Anderson, Antony, Elizabeth Ashley, Bono, Adam Clayton, Andrea Corr, The Edge, Flo and Eddie, Joel Grey, Bill Frisell, Guggi, Scarlett Johansson, Courtney Love, Lydia Lunch, Patrick McCabe, Maria McKee, Shane MacGowan, Eric Mingus, Larry Mullen, Jr., JG Thirlwell, Martha Wainwright, Rufus Wainwright, Chloe Webb, plus special guests. Tickets for the event are on sale via CarnegieCharge at 212-247-7800, Carnegie Hall and the box office. As is the case with every (RED)NIGHTS show, a portion of the proceeds from the concert will go directly to The Global Fund. Longtime friends and professional collaborators, Willner and Friday came together to bring the concert to life and raise awareness of (RED)'s mission. Friday, a childhood friend of Bono, is an Irish singer, composer and painter and founding member of the gothic rock group The Virgin Prunes. Willner has produced albums for Marianne Faithfull, Lou Reed, William S. Burroughs and Allen Ginsberg, yet is perhaps best known for assembling tribute albums and live events saluting Leonard Cohen, Thelonius Monk, Tim Buckley, Edgar Allen Poe and Marquis de Sade. Willner said, 'This unique evening is a celebration of Gavin and a gathering of friends and amazing musicians. We're all proud to partner with (RED) to help fight AIDS in Africa.' 'It's an honor to be a part of this (RED)NIGHT because I know the money generated will go directly to people who need it,' added Friday. At each (RED)NIGHTS concert, the participating artists aim to inspire fans to join (RED)'s mission to eliminate AIDS in Africa by pausing to highlight the many ways to get involved and encouraging those in the audience to share the message and experience with others. Ultimately, it is the goal of (RED)NIGHTS to build a community - of artists, concertgoers and music fans everywhere - that is passionate about helping to fight AIDS in Africa. 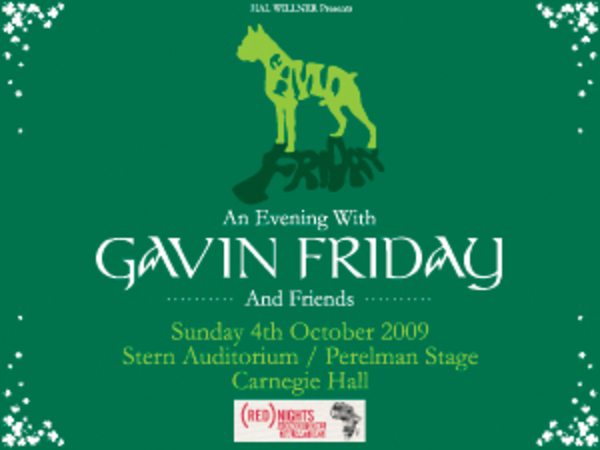 For more information, please visit www.joinred.com/rednights or www.gavinfriday.com .